The Clippers were on the road against Gardiner for a must-win game and came away with a vital 4-3 victory in their hunt for a playoff spot. On Saturday, Yarmouth will host Class A Cheverus for Senior Night. Game time is 5:30 pm. 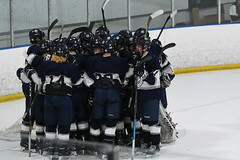 Yarmouth dominated play in the opening period outshooting Gardiner 10-5, but a bouncing turnover with 45 seconds left led to a Gardiner goal and a 1-0 deficit. In the second period, the Clippers came out strong and scored back-to-back, power-play goals on simple plays. 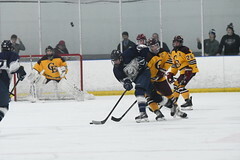 With a 5 v 3 advantage, Kurt Heywood ’19 (Guertler, King) fired a snap shot from the point through traffic, which the Gardiner goaltender did not see until it was in the back of the net. On the ensuring 5 v 4 advantage, Spencer King ’20 let a wrist shot go from the point into traffic, which Matthew Robichaud deflected to give Yarmouth a 2-1 lead. Michael Guertler ’19 picked up the secondary assist. The key in both goals was getting movement and bodies in front of the Gardiner net. Spencer King would then extend the lead to two goals when a broken play led to a partial breakaway and a Yarmouth tally. However, just over two minutes later, Gardiner cut the score to 3-2 with a short-handed breakaway goal off a Yarmouth turnover. As the game progressed, Gardiner continued to get a number of scoring opportunities off long passes as the Yarmouth forwards were often trapped on the forecheck. As has been the case all season, Charles Henry Watson ’22 came up big in net. In the third period, Joe Wilson ’19 extended the lead to two goals when Justin Veilleux ’20 battled to get the puck to the net. Veilleux’s pass caromed off the side apron of the goal to Wilson who put the puck through the Gardiner netminder’s legs. 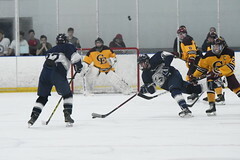 However, Gardiner again cut the lead to a single goal with a top-corner shot that was partially deflected. In the closing minutes Yarmouth was short-handed, but the penalty kill and Watson came through and the Clippers were able to hang on for the 4-3 victory.